New cadet registration for the 2018/19 training year is closed. Registration for the 2019/2020 training year will commence in September 2019. Please see below or visit the Join Us page under Squadron Info above for more details. The 111 Pegasus Squadron was established in 1939 (see our history page for more information). That makes the 2018 - 2019 Training Year our 80th Year. Our 80th Anniversary Parade will be held on February 9, 2019 at HMCS Discovery beginning at 1300 (all guests please be seated by 1230) and will be followed by a cadet/alumni dinner. The invitation to the 80th Anniversary Parade can now be downloaded here. If you are a Squadron Alumnus and would like to be contacted about upcoming events during our 80th Anniversary please register on the Alumni page by following the link at the top of this page. You can also request to join the "111 Pegasus RCACS Alumni" Facebook group. Photos from the 80th Anniversary Parade and Cadet/Alumni Dinner are now available here. The video of the 80th Anniversary Parade can now be seen on you YouTube channel here. Familiarization Flying dates have now been scheduled for March and April. Sign up is available on the Familiarization Flying page under the cadet information tab above. When you sign up for a familiarization flying date please make note of the date and time and remember to show up at the Pacific Flying Club ON TIME. Because of the high cost of flight time we have to manage time in the air based on the number of cadets who arrive at the airport. Therefore when you do not arrive on time not only do you lose out on your own ability to fly you also hurt the other cadets who were signed up to fly that day - they will get less time in the air because of your irresponsibility. If you become aware you won't be able to make a flying time you signed up for please remember to notify us at flying111air@gmail.com as far in advance as possible. The sign up for our Spring Gliding dates is now available on the gliding page under the cadet information tab above. Check out this report on the Feb 23 Level 2 Citizenship Tour. Reminder to all cadets interesting in applying for glider or power in the summer of 2020. The Scholarship exam will be in November 2019. We will not be offering fall ground school in 2019 because of the timing of that exam. If you are planning to write the Scholarship exam in the fall please sign up for Spring Ground School here. Classes will be every Wednesday from Feb 13 to May 29 except for March 27. Most classes will be at Langara College in room L215. Cadets who are attending classes will be notified of alternate locations for the dates we were not able to get Langara College. This Spring Ground school session is open to all cadets regardless of whether they are writing the exam in 2019. Applications for the various scholarships offered by the Air Cadet League of Canada are now being accepted and must be received by League HQ no later than April 1, 2019. There are also a number of scholarships offered each year by the BC Aviation Council for anyone pursuing various forms of flight training. Nominations for those scholarships are open now and must be received by the BCAC no later than May 31, 2019. Finally, the Vancouver Poppy Fund offers a bursary which is open to applicants with a proven financial need who have had a parent, grandparent or great grandparent involved in military service. These applications must be received by the Vancouver Poppy Fund no later than May 31, 2019. Details on all of these opportunities are available on the Cadet Scholarship and Bursary Information page under the cadet information tab above. The 80th Anniversary Pins which were distributed during the COs Parade tonight are now a part of your uniform and for this complete training year must be worn on your tunic at all times. Do not lose them! For instructions on where to place the anniversary pin please download the CATO excerpt found here. You can also download a photo showing proper placement of the pin here. Where: 2025 W11th Ave, Vancouver BC. When: Any Monday night during the training year. Please do not park/drop off within the military zone, instead please park/drop off by the elementary school adjacent to the squadron. For more information please see the "Join Us" page under the "Squadron Info" tab above or by clicking the link here. We have sent emails to parents about this issue in the past. We have also posted a reminder on the Squadron website. Finally, we asked all cadets to speak to their parents about this important safety concern. None of these have worked and we still have parents dropping cadets off on 11th Ave. Therefore please note the following important information. The drop-off and pick-up of cadets on 11th Ave in front of the Armoury creates a serious safety concern for cadets, parents and the general public and is strictly prohibited. It also results in access to 11th Ave which is a public road being illegally blocked by parents coming and going. Finally, it generates complaints from our neighbors. Therefore, parents please note that under no circumstances are you to drop off or pick up your kids by driving your vehicle down 11th Ave. This applies to Monday night training as well as all other cadet activities including drill team, RDT, first aid, band, tag days, etc... This applies regardless of whether your cadet is an AC just starting out in the program or a Warrant Officer who has been with us for a long time or anything in between. Starting on Monday April 9 an officer from the Squadron will be outside the armoury before and after ALL cadet activities and will be taking note of all cadets who are either getting out of or into a car on 11th Ave. Cadets who are dropped off or picked up on 11th Ave will be subject to disciplinary action from the Squadron which may negatively impact their ability to participate in optional activities and eligibility for future promotions as well as eligibility for summer camps, national scholarship applications, year end awards, etc. The only exception to this rule will be for cadets whose parents are inside the armoury and who are legally parked either on the south side of 11th Ave or at the parking meters at the West end of 11th Ave. Please pick up and drop off cadets on Maple St immediately to the east of the Armoury. Also note there is a significant amount of metered parking available on Arbutus St and if you are able to legally and safely park your vehicle there you may also drop off and pick up cadets on Arbutus St near 11th ave. Under no circumstance should a 111 Parent illegally block the flow of traffic on any of the streets surrounding the Armoury for cadet pick up or drop off. Thank you for your cooperation with this critical safety measure. An opportunity which cadets aged 16 and over might be interested in has been brought to our attention. Please note that this activity is not a direct cadet activity although it is being promoted to cadets through the Air Cadet League of Canada. 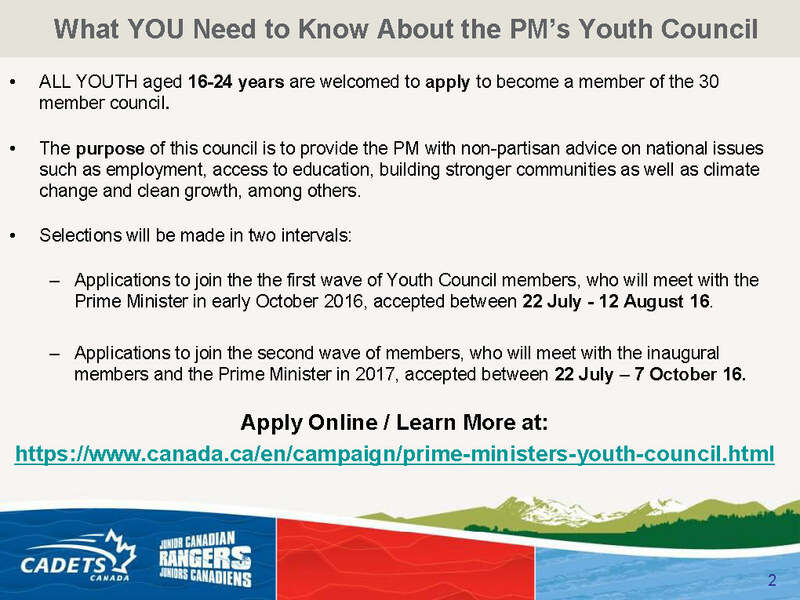 Below is the relevant portions of the text of the e-mail from Acting D/Comd, National Cadet & Junior Canadian Rangers Support Group and a jpeg with an outline of some of the key information. Please note that every Monday night our closing parade is scheduled to be completed at approximately 9:30 PM. Cadets will generally be dismissed by 9:45 PM although cadets who are on the duty flight for the night may be slightly later. In no event should a cadet still remain in the Armoury after 10:00 PM. Have a photo or video you think would look good in our photo library or on our YouTube page? Send them to 111webphotos@gmail.com for consideration. When watching our cadets during opening or closing parade please remember that the band playing O Canada and God Save the Queen along with the march on and off of the flags are significant acts of respect for our country and our monarch please remain silent during these portions of the parades. Thanks. All parents dropping off or picking up cadets or stopping by to enjoy watching part of our parade please remember the following issues related to parking to ensure the safety and well-being of all cadets and parents. The military zone in front of the armoury. Blocking access to the gated area beside the building. On the north side of the street between the building and the railway tracks. The area on 11th Ave gets very congested at the beginning and end of the each training night in order to ensure the safety of all of our cadets and their families please remember there are easy drop off/pick up points on Maple Street to the East of the Armoury or on Arbutus Street to the West of the Armoury. Please make the process faster and easier for all cadets and their families and help reduce the impact on our neighbours by using these locations. For general information about the 111 Pegasus Squadron designed for parents please download the resource guide here. Parents can download the PowerPoint presentation used at the parent information night by clicking here. Joining Instructions for 2018 Cadet Summer Training have now been posted on the Summer Training Page under the Cadet Information tab above. Can't Make it to Mandatory Training? *Please note: phone calls/voice mail are not acceptable. If you do not send this information before the event, you will be marked absent rather than excused. While the activities of the 111 Pegasus Squadron are supported by the Department of National Defence and the Air Cadet League of Canada along with the 15th Field Regiment, Branch 176 (Billy Bishop/Kerrisdale) of the Royal Canadian Legion, ANAVETS Unit 26 and all of our other supporters, there are a number of costs the 111 Pegasus Squadron Sponsoring Committee is required to fund directly. We do fundraising activities each year through various channels; however, your help is always greatly appreciated. The 111 Pegasus Squadron Sponsoring Committee is a registered charity (Charity Registration: 119310035RR0001). Please consider donating to our activities either directly by contacting our Treasurer (or another member of the Executive Committee) or through PayPal by clicking below (please note: PayPal charges an administrative fee for online donations so where possible direct donations are always preferred).